Not to be outdone, Ladies got in on the act and a wristlet consisting of a silver plaque with a black silk ribbon, was fashioned. 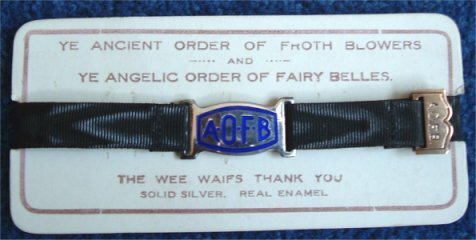 It was not a ladylike thing in the 1920's to be associated with the drinking of beer so the "affiliated" Angelic Order of Fairy Belles was born. A.O.F.B. founder Bert Temples' mother Mary was Fairy Belle No.1 and she was also a director of the A.O.F.B. There are pages dedicated to the Fairy Belles in later Membership booklets. Wristlet clasp variation - later wristlets had A.O.F.B. engraved on them. Some 'high ranking' Fairy Belles had gold wrislets - Mary Temple , Berts mother and A.O.F.B. director, had one as did Sir Alfreds daughter Betty - herself a Tornado.